There are several types of Muscat; hence any expert finds some difficulties when it comes to classify them. Muscat vines were first grown in the Ancient Greece, where excellent sweet wines were produced. Muscat vines became diffused in the area of Colli Euganei thanks to the Romans, who highly estimated the wine produced from them. Golden Muscat grapes are very different from the Blanc Muscat à petits grains. The previous have an intense yellow colour when ripe and specific organoleptic marks. However both the types have the typical aromatic scent of Muscat, hence the name. Wine making process Grapes are stored in a cool winery until they reach a temperature of 7- 8°C. They are pressed by means of a pneumatic press and the must is then kept in a steel vessel for 12 hours at a monitored temperature and becomes clear. Once decanted, it partially ferments at a monitored temperature of 18-20° C until it reaches 5-6 ° of alcohol, in order to produce a sweet wine. After decanting, it is filtered and poured into the most suitable vessels, where it ferments for 40-90 days by means of yeasts. 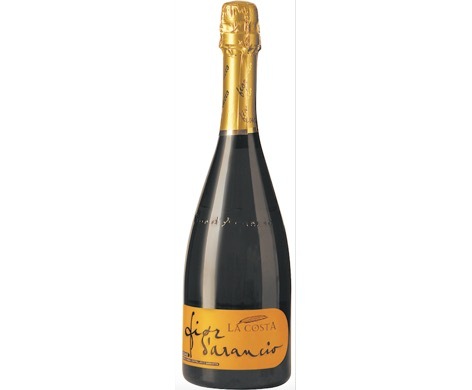 It is then bottled and sealed up with the typical champagne cork and launched on the market after a few months. Nose: a fine, delicate fusion of all the noble scents of Muscat: rose, apricot, orange, apple and spices are all perceived. Mouth: the fusion of fruity notes is enhanced by the sparkling. Nice wine with a sweet finish. It goes along best with desserts, such as pies, biscuits and fruit tarts.